Following up on last month’s San Ramon Valley Real Estate Inventory update here are how things are looking at the end of May. The “buzz” continues as the market remains active. With more buyers in the mix, sellers are getting a bit of a break with lower marketing times and in some cases multiple offers. I will take a look at the numbers again at the end of the month and check back in. Also, as June 2012 comes to a close (can you believe the year is almost half over?) I will report the sales results for the first six months of the year versus last. In the meantime if you have any questions about buying or selling in the San Ramon Valley…give me a “shout”. 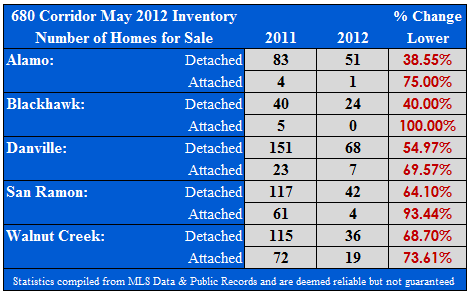 Here is a look at the inventory of homes for sale at the end of May 2012 and the change over 2011. As you can see there are a lot fewer homes for sale in these markets versus last year. Share the post "San Ramon Valley Real Estate Inventory Update for May"